Curves in all the right places: Live user kabuki illuminates the new crossfader curves in Live 6. Thanks, kabuki! The second from top, “transition”, is the crossfader curve you know from Live 5, and will be selected by default in any projects you import from the previous release. Having a true constant cross-fade should be really handy, however, as will the ability to shape other curves. The beta versions keep rolling out, but the beta list is pretty narrow. For those of you who have been waiting patiently but haven’t gotten to the beta, I do think you’ll get access to Live 6 soon. I’ll keep adding plenty of Live 6 info here on CDM, just because I know so many of our readers are Live users. 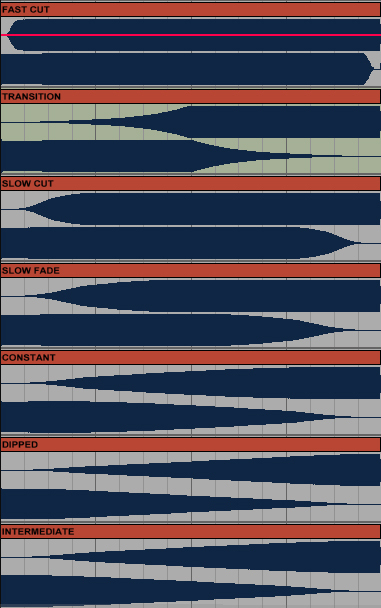 Crossfader curves are a relatively minor feature in Live 6 compared to the rest of what’s in there, but this brings me to a question: how many of you non-DJs make use of the crossfader? I know that, compositionally, it’s something I like to have in live performance, because I’m more likely to want to fade from one thing to another than to try to mix eight or more channels live. Now that I have a Faderfox DJ2 controller, because I liked the DJ layout better than the generic Live layout, and crossfader curves, I intend to use this even more. Is it just me, or are other non-DJs appropriating the veritable crossfader?